We are excited to begin blogging in order to keep you better informed of the events and issues surrounding Memory’s Ministries. We will be periodically posting interesting information that may be of interest to you. 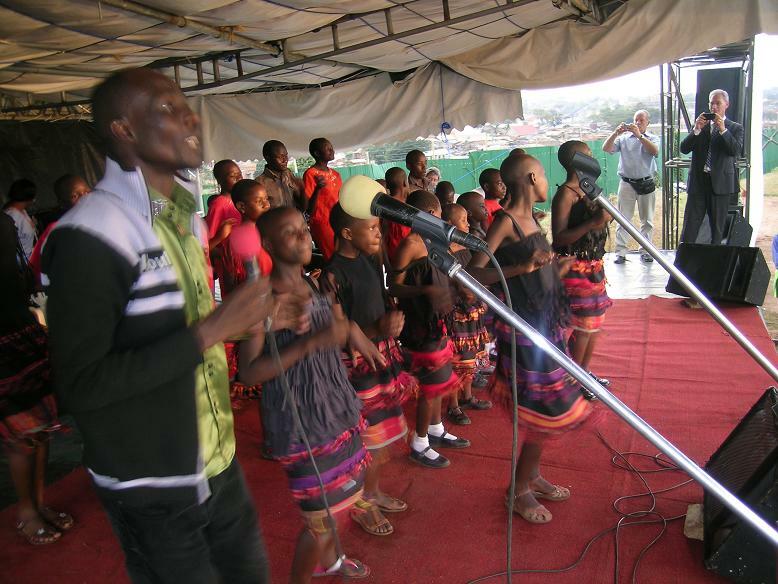 This past October, 2011, the choir had the privilege of singing at a campaign in Kampala, that featured Evangelist Dr. Max Solbrekken of Canada as speaker. The children were happy to bless the attendees with their singing, and were blessed themselves. It is now the rainy season in Kampala, and with this comes the flooding in the slums where Memory ministers. This means some hard work is needed to clean up the area, but it becomes much easier when there is a little helper on hand. Because of the flooding that often occurs in the slums, and the valuable time it takes to do the clean up, means that Memory’s time to help the children is greatly reduced. However, thanks be to the Lord, an opportunity has come where he can operate a ministry center in a different compound where no flooding can occur. Here, the children can gather together comfortably and Memory can have an office which will help him to be more productive. There are numbers of children living in the slums who are in need of food and clothing. As funds become available, Memory faithfully sees to these needs. In addition, he gives food staples to needy families, distributes school supplies, and pays for some children’s school fees. Memory has redesigned the donation part of the ministry, and will no longer offer children for sponsorship. This is because there are many needs, so the more efficient way to use donations is to use the funds where they are most needed. My name is Audrey Pihulyk. I live in Edmonton, Alberta, Canada, and am the person formatting this blog. When volunteering in Kampala in late fall, 2008, I met Memory and was impressed with his vision for ministry and his dedication to the needs of children. Since that time my husband and I have adopted Memory as a son in our hearts. We have been in close contacrt with Memory since fall, 2008, and have been advising him re finances and to the direction of his ministry. We have found that Memory stretches every dollar in order to help the children and families, many times going without his own needs being met. At present we do not offer charitable receipts. Prayer is important for it moves the hand of God. Memory thanks you for your on-going prayer for his ministry. This entry was posted in News Items and tagged Kampala, Memory, singing, Solbrekken, Uganda. Bookmark the permalink.